A good classic lasagna is a great recipe to have at the ready. I have been making this recipe for so many years that I have it memorized. I've shared it before, but I've tweaked it a tiny bit, plus it deserved a better picture. Again! 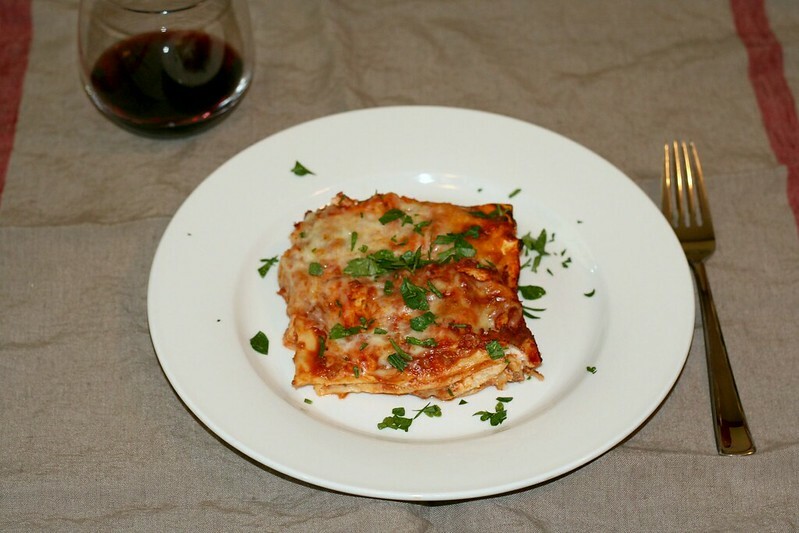 It really is my favorite lasagna, and quite possibly one of my favorite meals to make. I remember it's actually the first meal I made in our house when we bought it in 2007. I distinctly remember that as it was baking in the oven I was heating some water in a tea kettle on the stove. The door rang and I could not get the person to leave me alone and just go. Even as the kettle was whistling. Sadly, that ruined my rarely used, and never sense again used, tea kettle. Sigh. Maybe that's why I don't drink hot tea?! That was a random weekday, and now I just don't have time to make lasagna on any given weekday. Now I love to make lasagna on lazy weekday afternoons, to eat during the week. Plus, my absolute best time saver with big pastas like this is to make half if one of my 8x8 baking dishes, and the other half goes in an aluminum foil 8x8 disposable tray from the grocery store. That one goes in the freezer before ever baking it. Ready to go whenever I feel like it next. You can either bake from frozen, it'll just take a lot longer (hour fifteen generally), or I usually just take it out the day before I need it and let it thaw in the fridge. You seriously cannot beat a ready-to-go lasagna on a weekday. And, you may think I'm crazy for using my oven a full hour when it's 95 degrees out.... I just took Ty to the basement to let him play in his play area while I cleaned. Basements are always cool! Heat olive oil in a large skillet over medium-high heat. Cook onions until transluscent, about 4 minutes. Add garlic and simmer about 30 seconds until fragrant. Add beef, chopping and stirring occasionally until cooked through and no longer pink. Add wine and let simmer a minute or two. Stir in tomato sauce and tomato puree. Stir in oregano, basil, red pepper, salt and sugar. Reduce heat and allow to simmer while preparing the rest. In a medium bowl beat 2 eggs. Add Parmesan cheese, ricotta and 1/2 cup shredded cheese. Layer bottom of 9x13 baking dish with 3/4 cup of sauce. Using an offset spatula, spoon or knife, spread 1/3 of the cheese mixture on 4 noodles. Place on top of the sauce. Spread 1 cup of sauce over the cheese layer. Top with 1/2 cup of shredded cheese. Repeat for 2 more layers. Top the final layer with 4 plain noodles. Spread 1 1/2 cups remaining sauce over the plain noodles, making sure all edges are covered with some sauce. Top with the remaining 1/2 cup shredded cheese. Bake for 40-45 minutes until the cheese is melted and the edges of the sauce are bubbling. Allow to sit for 10-15 minutes before cutting.